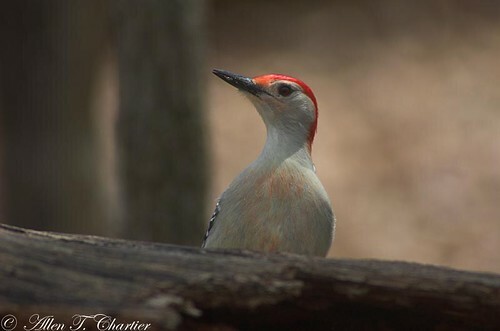 The male has a red cap extending from the bill to the nape of the neck. The female has a red patch on the nape, a small red patch above the bill, and a gray cap. Sometimes seen at bird feeders in the fall taking black oil sunflower seeds. No subspecies are currently recognized, although it is widely agreed that more study is needed. Some authorities recognize four subspecies. Under tthis classification, only Western Red-bellied Woodpecker (Melanerpes carolinus zebra) has a range extending into Minnesota. 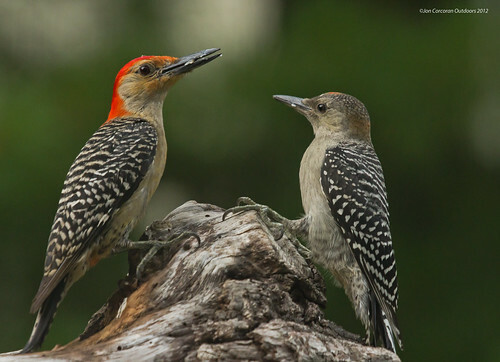 A documentary of a pair of Red-bellied Woodpeckers building their nest, feeding the young, and some fledgling behavior after leaving the nest. They really do have Red bellies! This video was recorded in Eastern Massachusetts in late May. The adults are making frequent food deliveries to the nestlings who are near fledging. The caterpillars of an invasive moth that is doing major damage to our woodlands accounted for most of their diet during this period. The video was shot with a Canon EOS 7d and 600mm f4L Canon lens and is best viewed in full HD. Red-bellied Woodpecker (Melanerpes carolinus), Flowering Dogwood (Cornus florida), Wilderness Garden, Gagnon Wildlife Habitat, Pottersville, Somerset, Massachusetts, Thursday morning, February 6, 2014, 7:00 AM - Canon PowerShot SX50 HS MVI_72598; 1:14 min. Seen on our suet feeders. 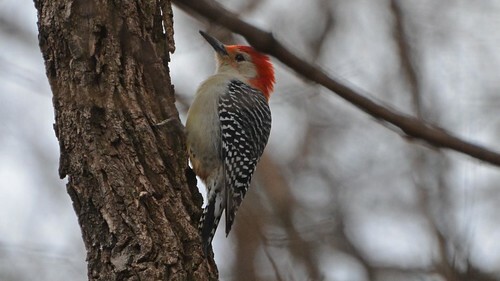 Beautiful red naped/capped male came to bird feeders.